Less chance of that with Roger Allam’s dishevelled Vanya, gripped in a sudden alcoholic crisis and resigned to lacing every sorry statement with a shot of cynicism, as only this fine actor can. 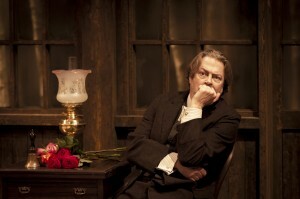 At the heart of the production is Roger Allam’s Vanya, less the “holy innocent” but a man full of resentment and bitterness. What Allam brings out so well is the emotional immaturity of the man. This is a man who has been suffocated through duty and through boredom and Allam gives us the full range of his arrested state : he gazes at Yelena with puppy-dog admiration like a member of the lower sixth in the throes of his first love and like any teenager, he has a fantastic range of sighs and petty flounces. But while it’s easy to think of his as a buffoon, there are moments of real pathos too – catching sight of Astrov and Yelena kissing, he pulls a bunch of red roses so the petals fall through his hands like a trickle of blood. – it’s an arresting moment, that captures the full extent of Vanya’s despair. Roger Allam’s Vanya is a long-suffering man whose every gesture suggests lethargy. He has given his life to the service of Professor Serebryakov, a talentless pedant whom he once mistook for a figure of handsome erudition. Vanya has lapsed into a state of rumpled disappointment. When eventually his sense of missed opportunity provokes him to anger, Allam brings an agonized conviction to this outburst. (…) With Allam at its core, this is an emotionally truthful production, absorbing and affecting. Roger Allam’s Vanya is a marvel, moving between sullen depression and rapier wit, hopelessness and passion. Allam’s Vanya is, as Chekhov must have wished, a tragic buffoon. You see from the start the absurdity of a man who has slaved away for an academic brother-in-law he detests: emerging from a drunken slumber, a dazed Allam immediately collides with a door. And the comic aspects of Vanya are captured by the way he tries to hold in his slight paunch or lunges like a spaniel at the beautiful Yelena. But there is also real tragedy in this performance. In the great scene where Vanya rounds on the Professor, Allam almost unconsciously picks the petals off a bouquet of roses to symbolise his wasted life, and stutters helplessly when he cries “I could have been a Dostoevsky.” In its interweaving of comedy and despair, this is the best Vanya since Michael Redgrave in 1962. If I have to express a personal preference, I’d plump for Roger Allam’s fantastically hangdog portrayal in Jeremy Herrin’s production in Chichester (…) Allam has the edge on the character’s mocking and self-mocking tendencies. From the moment he enters Peter McKintosh’s beautiful set (dotted by birch trees, dominated by a window-lined wooden veranda wall), swaying drowsily and drunkenly, we see a childishly lost soul mired in gnawing adult remorse; just the way he stares after Lara Pulver’s beautiful, unobtainable Yelena (the professor’s young second wife) is heartbreaking, as is the way he grasps his accursed accounting abacus like a baby at the end, at once immeasurably aged and shrunken after his cataclysm of pointless ire. There’s plenty to savour, not least Allam, who gives us the midlife crisis as a doleful little-boy strop thrown in the knowledge that life will always be just out of reach. With such a tragic story, it surprising how much comedy there is in the script and Roger Allam as Vanya is a master of the art seeming only to need inflection and pertinent pauses to create a laugh, yet his mood can turn in an instant to frustrated jealousy, with the bouquet he is bringing to Yelena shredded in his hands at the sight of her in the doctor’s embrace. Hearing the professor’s plans, his fury erupts in impotent despair that he has wasted his life in useless toil and cannot even manage revenge. “I was a fool to shoot twice and miss both times”. An outstanding performance of a man at the end of his tether, his anger followed by total despair. 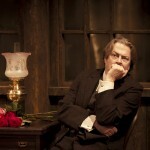 With his floppy fringe and handsome, broad brow, Roger Allam looks disconcertingly like the late polemicist Christopher Hitchens. That put me off a little during Chichester’s bespoke new production of Uncle Vanya.